Throw Rag – Founded in 1993 by Captain Sean (Doe) Wheeler following a string of desert punk bands including The Sciotics and Cactus Slim & The Other Cities Band and they continue to tour and record today. Authentic desert psychobilly featuring brazen first rate showman, Sean Wheeler, known for his wild stage antics which have included performing in his birthday suit and doing felatio on his microphone. Wheeler brings a lot more to the table than wild theatrics, he crafts together memorable tunes that are rooted in old school punk with a rockabilly flare, and clever lyrics exploring relevant subject matter ranging from love gone bad to death by overdose. 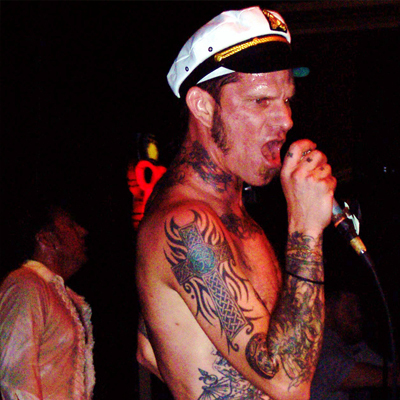 Often referred to as the Sea Captain of the Desert, Wheeler steered this ship to success opening shows for The Supersuckers, Circle Jerks playing major shows like Van’s Warp Tour. The band features a crew of impressive seamen that run an air­tight ship including Frank “Fontanta” Cronin on bass, Patrick “Dino” Bostrom on lead guitar, Chango Von Streiker on drums. Past members include Scott Brooks, John Summers, Tom Lynn, Dan Lapham, Craig Jackman, and Tony Portillo. They have several full length records beginning with Tee Tott on Hellbound Records, a split with Supersuckers, Desert Shores, 3 Feet and Rising, which features guest vocals by Keith Morris (Circle Jerks), Jello Biafra, and a cover of Merle Haggard “Tonight the Bottle Let Me Down” performed by guest vocalist Lemmy.